I love metallics and jewel tones every time of the year. 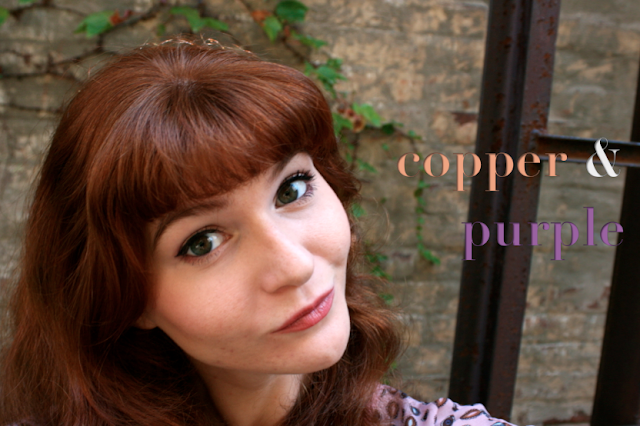 This eye make-up look is a brighter take on copper & amethyst, contrasting the usual deep, dark smokey looks of autumn. Combining these two colours creates a gorgeous effect that enhances every eye colour. The overall look is surprisingly acceptable for everyday. I used Mica Shimmer Powder in Bronze which is the perfect copper shade (contrary to the Bronze name). It has some iridescence to it as well which looks gorgeous in the light. Even though it's a loose pigment, it applies with minimal fall-out with a regular dry shader brush. To define my eyes, I used Nars Kuala Lumpur I which is a berry shade with gold shimmers. I finished the rest of my eyes and face with neutral products. Whenever I am feeling like adding a bit of colour to my make-up, purple is my go-to. Pairing it with a copper is a brightening look with a bit of a twist. What metallic & jewel tone colour combinations do you love?